The world's most unmistakable voice returns to the big screen when Josh Groban Bridges from Madison Square Garden comes to select cinemas nationwide for a spectacular one-night concert event on Tuesday, February 12, 2019. 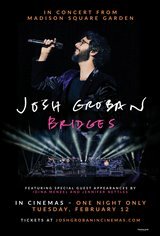 Following the release of Groban’s eighth studio album, Bridges, which debuted at number one on the Billboard U.S. Top Album Sales chart in October, this concert, which features a mixture of both new and classic hit songs, also includes covers such as the standard “Pure Imagination,” Billy Joel’s “She’s Always A Woman” and "Bring Him Home" from Les Misérables. The concert was recorded before a live audience during the final U.S. stop of Groban's 2018 Bridges Tour at the famed Madison Square Garden. The multi-platinum award-winning singer is joined by Tony-Award winning, multi-platinum recording artist Idina Menzel for two duets: the angelic “Lullaby” and the emotionally-charged “Falling Slowly” from the movie Once. He also performs the duet “99 Years” with Sugarland's Jennifer Nettles before closing out the show with his signature song, "You Raise Me Up."